I gave up on my childhood friend Melissa Baker back in October 2014. I had driven a few hundred kilometres to see her face to face after some worrying online conversations. Mel was diagnosed with Hodgkin’s Lymphoma exactly six months after my breast cancer diagnosis back in 2013 and began writing the blog I Got The Good Cancer. We referred to ourselves in jest as Kylie Minogue and Deltra Goodrem, Australian popstars that shared our cancers. We joked that there was something toxic in the school playground we shared all those years ago. I’m just starting chemo, Mel yet to know she has cancer early 2013. When I arrived at her home and walked up the stairs to her front door, I glimpsed her through the window. Her skeletal frame took my breath away. With the spark gone from her eyes and plagued with respiratory infection after infection, Mel had no immune system and no further treatment options offered to her. I honestly started to grieve for her demise. This 39 year old, brilliant forensic pathologist and single mum to two beautiful kids had so, so much left to contribute. I cried all the way to her house and all the way home from that visit. By the time I reached my city, my eyes were so swollen I could hardly see the road ahead. When Mel’s treatment team gave up on her she sacked them and moved to another Melbourne hospital. Her new hematologist was at the forefront of a melanoma drug trial to treat lymphoma and Mel ensured she was the first Australian on that trial. Not content with this last attempt to save herself, she has worked tirelessly to advocate for other lymphoma patients who are in the same dire position she was. She helped recruit and connect patients to the trial who had been offered no hope, and has given them much more time with their families. She no doubt will one day be credited with being the integral link that alongside the drug and doctors, saved their lives. Two years on, Mel is in remission, and as she approaches the last eight months of the trial. she doesn’t know what the future holds beyond it. The drug is so new no one is able to yet talk of it as curative. Mel is unbeleiveably relentless in her quest to raise enough money to fund the first specialist lymphoma nurse for Australia’s fifth most common cancer in which 5000 new Australians will be diagnosed with the next 12 months. By comparison, The McGrath Foundation for breast cancer currently has 110 nurses nationally supporting patients and their families. I’d like to sincerely apologise to my friend for prematurely losing hope. The lesson here is there is ALWAYS hope. Mel will host a fundraising event dubbed “Not Your Average Trivia Night” at Frankston RSL’s Simpson Room on Friday, November 11, from 7pm. The event includes live music, three course meal, raffles, silent auctions and more. Tickets are $75. Read all about Mel’s courageous story in print here. I Got The Good Cancer Oh no you didn’t! Who would have thought when my long term school friend Mel went and copied me and got cancer in the same year as me, both in our thirties and each of us with two very young children, that we would joke about who had the good cancer? We also joked we were the 2013 version of Delta Goodrem and Kylie Minogue, stars who have survived the very same diseases we have been brushed with. To date, that Delta and Kylie blog post I wrote on learning of the devastating news that Mel had been diagnosed with Hodgkin’s Lymphoma, still makes me teary. Especially since a third friend of ours, who is also in her thirties with two very young children has been diagnosed with Hodgkin’s Lymphoma in recent weeks. The real Kylie and Delta. Survivors of breast cancer and hodgkin’s lymphoma. Cancer competitions and jokes aside, we have always understood that there is no good cancer, and Mel made this point very early when she created her blog titled “I Got The Good Cancer” in jest. Now, Mel needs our support! Her fifteen months of gruelling treatment has not been successful to date after a year of different chemos and a stem cell transplant. There is a wonder drug that could clear her of this disease, but it’s not yet on the Australian PBS unlike the UK and Europe where it is readily available. Mel will have three cycles of a drug called Brentuximab at a cost of $10,600 dollars a cycle and will then be scanned to see if Brentuximab is moving her towards remission. If so, she will need a full course of sixteen cycles at a cost of $169,600 dollars. Mel has always aimed high in life and has for months been recruiting people to join the bone marrow registry worldwide. She is aiming for 100 new donors to sign up and is a quarter of the way there. She also helped to raise over $71,000 dollars for my treating hospital for women’s cancers despite her going through treatment herself and not having a women’s cancer. That’s the sort of selfless individual she is. So lets help this Goal Shooter get to her goal! Any funds raised in excess of funding Mel’s treatment with this drug Brentuximab will be donated to Lymphoma Australia, who supports research into one of the fastest growing cancers in the western world. You can donate by clicking on this link https://igotthegoodcancer.everydayhero.com/au/melissa. Donations are tax deductible to Australian residents. Also if eligible join the Bone Marrow Donor Registry in your country, and think about donating blood. Here we are in together in 1985 and in 2014. 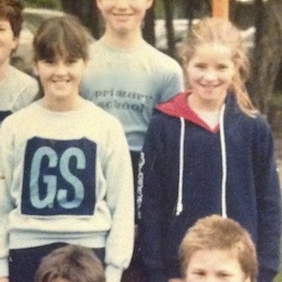 Twenty-nine years on, Mel is still a goal shooter, just not in a netball sense!